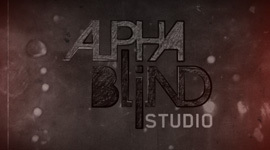 Alphablind Studio and Custom Horror proudly present sneak preview of our upcoming iPhone app Monster Museum. David Liwoch, a man behind Custom Horror project is drawing new monster every day. 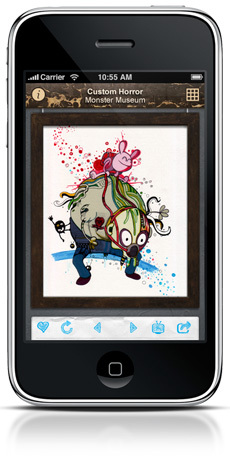 These monsters will then travel straight to your iPhone where you can browse through the collection of characters archived in the museum. In addition you can watch screencasts how some of the monsters are being created and save the favorite ones to your Photo Library. All monsters are protected with Creative Commons licence and are free for personal use. Daily monster is also available as EPS file on Custom Horror website. If you’d like to use the monsters for commercial work, there is a monthly subscription model for businesses. 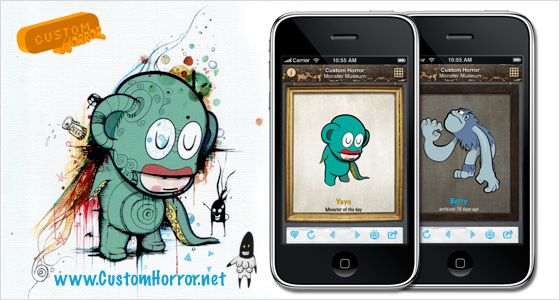 Custom Horror: Monster Museum application will be soon available on the App Store!